Essential notice to Messrs. Subscribers. 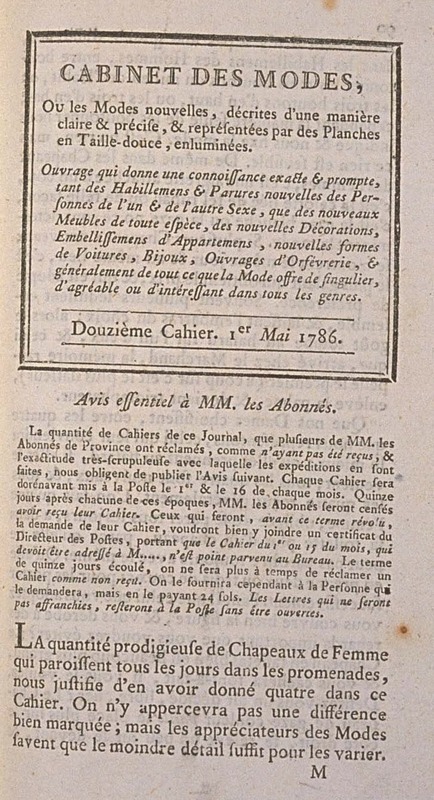 The number of Books in this Journal, that several of Messrs. Subscribers of the Provinces have asked, as not having been received, and the very scrupulous exactitude with which expeditions have been made, oblige us to publish the following Notice. From now on each Book will be taken to the Post on the 1st and 16th of each month. Fifteen days after each of these dates, Messrs. Subscribers will be supposed to have received their Book. Those who, before this term has passed, make a demand for their Book, are requested to send a certificate to the Director of the Post, concerning that the Book of the 1st or 15th of the month, which would be address to M. ..., never came to the Office. The term of fifteen days elapsed, there will no longer be time to ask for a Book as not received. It will be furnished, however, to the Person who asks for it, on the payment of 24 sous. Letters which are not franked, will remain in the Post without being opened. 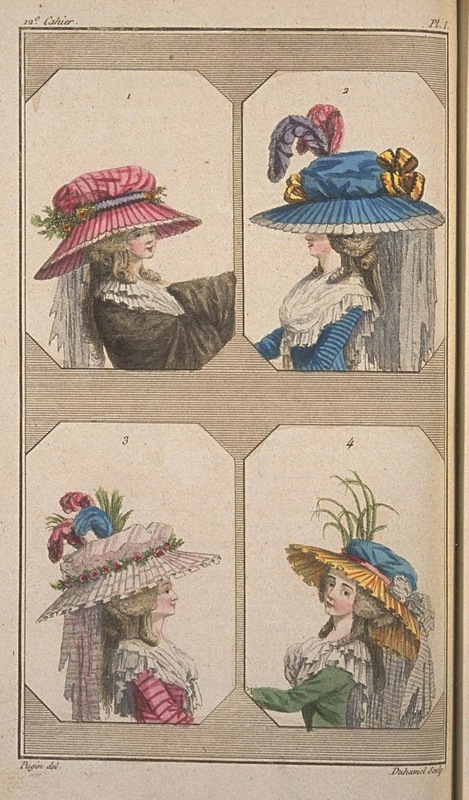 The prodigious quantity of Women's Hats which appear every day in the promenades, justify us in having given four in this Book. A well marked difference will not be perceived between them; but appreciators of Fashion will know that the least detail suffices to vary them. Assuredly there is not a great difference, in Men's Dress, between buttoning three buttons in the middle of the Coat, or the top three buttons, or the bottom three buttons; however only the manner of buttoning them is indicated to us and fixes fashion for us. It is nothing, but this nothing is discernible. The same is in Women's Hats, it is an aigrette attached on one side, it is the crown tied with this ribbon or in that fashion, it is white gauze or black gauze, which determines fashion. If several new Hats show themselves on the same day and in the same place, it is the most galant which gets the prize, and which is adopted by preference. Often several seduce together, and leave an embarrassment of choice; thus taste falls at chance to one of them, and the one that, turning up at the Merchant's, memory recalls first (without fail it is the most flattering), carries away the palm, and becomes the winner. Our Ladies may choose, between the four that we present, the one which suits them best; they may take by chance, if they wish; all four are new, and all four generally received. One knows that a Woman, obliged to get dressed ever day, has in her toilette more than one hat, because she cannot appear always in the same. She make take two or three of these to wear them successively. Is it necessary that the one you adopt covers your face well, and conceals you from importunate looks that you would like to avoid? The Hat in blue taffeta is much larger, and will hide you entirely, if you want that. Do you desire a decided, free, proud air? The straw colored gauze Hat is placed more on the right size, is lifted up a little in the front, and leaves the face uncovered. I would like best, for myself, the one in striped pink taffeta: placed right on the head, which is covers rather well, it gives an indescribable fine and cunning air, which is not unbecoming. Is it its color which spills forth on the face a rosiness which flatters and seduces? I would be tempted to believe it, as it pleases me. The Hat marked no. 1 is mounted on a frame in pink taffeta, striped and pleated, scalloped all around, and trimmed with blonde lace. Its Crown is puffed, and tied at the bottom with a lilac and black Ribbon au Diadême. On the front and back of the Hat, in the place where the Crown is tied, are fixed two bouquets of artificial flowers. In the back hangs a tuft of pinked white gauze, attached to the Hat. The Woman's throat is covered with a Kerchief of puffed linen-gauze, and her shoulders with an ample Mantelet of black taffeta. 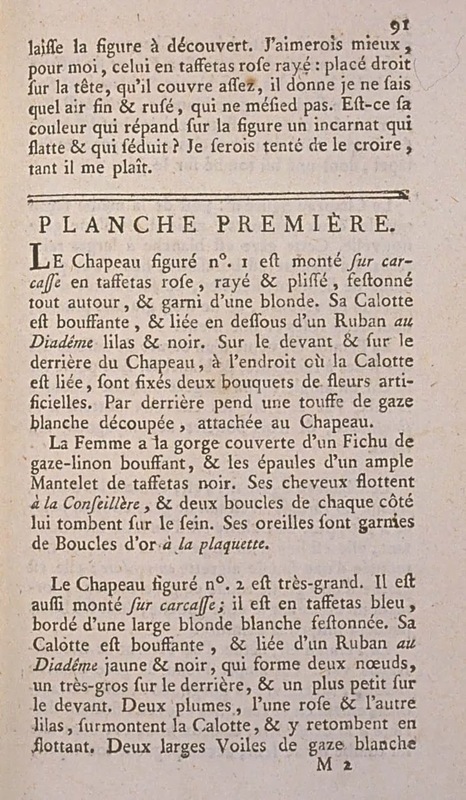 Her hair hangs à la Conseillère, and two curls on each side fall on her chest. Her ears are trimmed with gold Rings à la plaquette. The Hat marked no. 2 is very large. It is also mounted on a frame; it is in blue taffeta, edged with a wide white scalloped blonde. Its Crown is puffed, and tied with a yellow and black Ribbon au Diadême, which forms two bows, a very large one in the back, and a smaller one in the front. Two plumes, one pink and the other lilac, surmount the Crown, and fall back to hang. Two wide Veils of white gauze hang behind, attached to the Hat. The Woman is covered with a Pierrot of Indian taffeta with wide blue and white stripes. On her neck is a Kerchief of white gauze, flounced. 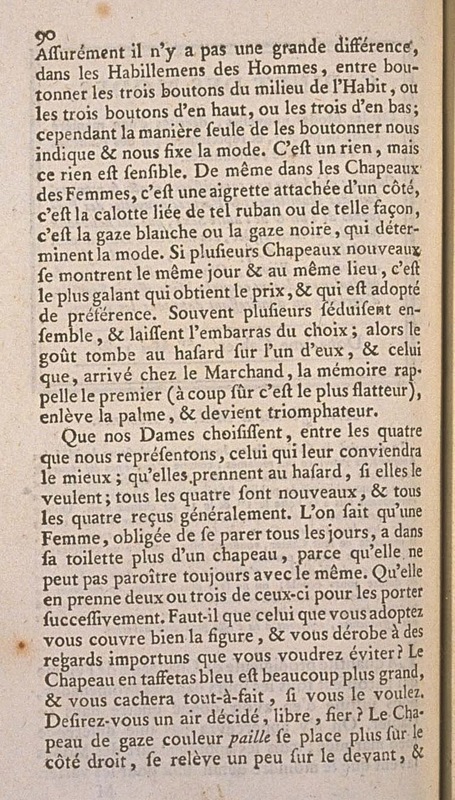 In back her hair hangs à la Conseillère; and on each side two curls accompany her tapet, of which one falls on her chest. The Hat marked no. 3 is made in the same fashion as the two first, but it is of a new gauze. This gauze is white with large pink stripes. The Crown is puffed, tied with a garland of artificial flowers, and surmounted with an aigrette of greenery, and with three large plumes, of which two are pink and one is blue. The Hat marked no. 4 is, like the others, mounted on a frame; it is made of straw colored gauze and in large pleats. Its Crown is of a puffed blue satin; it is tied with a wide pink ribbon, and surmounted with a simple aigrette in greenery; it is trimmed with a large tuft of white gauze, forming a bow on the left side, whose ends hang to the waist. The Woman is dressed in a Pierrot of green Gros-de-Naples. An ample Kerchief of flounced white gauze covers her throat, and puffs out extraordinarily in front. 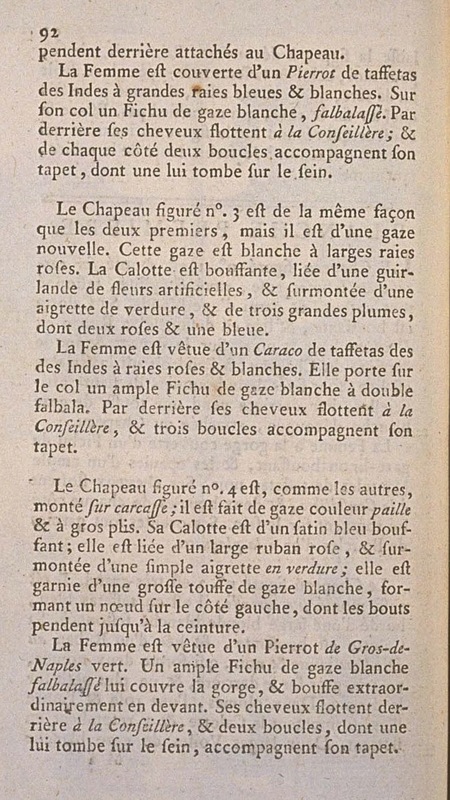 Her hair hangs behind à la Conseillère, and two curls, of which one falls on her chest, accompanies her tapet.